The Life University campus is situated on a tract of land encompassing approximately 110 acres. The campus consists of approximately 18 buildings that provide over 435,000 square feet of space. LIFE’s beautiful campus has highly sophisticated facilities with the potential to add new programs and majors at the University. The University is located at 1269 Barclay Circle in Marietta, Georgia. The main campus is approximately 15 miles northwest of the heart of Atlanta. Life University joins a host of other educational institutions in the Metropolitan Atlanta area, including Kennesaw State University, Georgia State University, Georgia Institute of Technology, Emory University, Mercer University, Oglethorpe University, Agnes Scott College, and the Atlanta University Center (Clark Atlanta University, Spelman College, Morehouse College and Morris Brown College), as well as many business, technical and art schools. Administration Building — Soon to be renamed the William M. Harris, D.C. Center for Clinical Education, the main Administration Building provides administrative spaces for the administrative offices, Information Technology, The Dr. Sid E. Williams Research Center, Diagnostic Imaging Alignment and other operational offices. Also included in this building is the Campus Center for Health and Optimum Performance, Funded by Foot Levelers, a student practical teaching facility where early-quarter D.C. students begin their hands-on training to become skilled chiropractors. The LIFE Village Retreat — Also known as the LVR or simply “The Village,” this building is a four-story student housing facility for students. It is located next to the Administration Building and was completed in the fall 2009. It contains 300 beds in primarily two bedroom, roommate-styled suites. There are furnished units that all include living areas, kitchens with refrigerator, microwave, stove, sink/garbage disposal, dishwasher and feature reserved parking. The buildings have community rooms, quiet study spaces, elevators, a mail kiosk and use proximity card access. The LIFE Village Retreat is Gold Level certified by Leadership in Energy and Environmental Design (LEED), the authority in sustainable and “green” construction. The Parking Garage is located immediately adjacent to the LIFE Village Retreat and contains a 600-car parking deck. The University has installed video surveillance in all the public areas of the Retreat’s buildings as well as the parking deck for additional safety. The Commons — These other on-campus apartments primarily house LIFE’s scholarship athletes. Learning Resource Center — The LRC houses the Student Advocacy Center – a one-stop-shop for all student administrative needs (Registrar, Financial Aid, Student Accounting and Advisement). The Learning Resource Center also houses the Drs. Sid E. and Nell K. Williams Library named after the founders of Life University. The 20,000+ square-foot facility contains stacks for 100,000 books, computer areas with more than 50 student-available computers, study and conference rooms for student and faculty use and an audio-visual support area. Enrollment Services, the Student Advocacy and Advisement Center and Financial Aid can also be found in the Learning Resource Center. Center for Graduate and Undergraduate Studies — CGUS is the primary location for all of the educational facilities, the departmental faculty and the administration offices for Undergraduate Studies. The building also houses the PAR Center (Preparation, Analysis and Record keeping), the Virtual Anatomy Lab and faculty offices for two of the College of Chiropractic divisions (Basic Sciences and Clinical Sciences). The building contains amphitheater-style and standard lecture classrooms, computer lab and training facilities, various chiropractic technique and lab rooms. This building also contains standard and specialized laboratories for Basic, Clinical, Natural and Nutrition Science Departments. Linking the Learning Resource Center and the Center for Graduate and Undergraduate Studies is a plaza with landscaped gardens, a vine-covered arbor and a reflecting pool. Bricks inlaid in the plaza pave the Walk of Honor in recognition of alumni and loved ones of Life University. Socrates Café — Located at the north end of the Center for Graduate and Undergraduate Studies, Socrates Café was opened to students, staff, faculty and visitors in January 2010. The 28,000 square foot state-of-the-art facility and outside patio and seating areas integrate leading-edge design with world-class sustainability features. The Café was built to a LEED Gold standard. Socrates Café features many “green” initiatives, serving locally and organically grown food and minimizing waste through responsible recycling, biodegrading and composting. The Café also provides a meeting place for students late into the evening for study, conversation and special events. The Café area also includes the administrative offices, food preparation laboratory and display cooking area for the Nutrition Program in the College of Graduate and Undergraduate Studies, as well as the Life U Shop. Celebration Plaza — In the area connecting the Center for Graduate and Undergraduate Studies and the Center for Chiropractic Education lies Celebration Plaza, site of many of LIFE’s on-campus events. It is a fitting place for the LIFE community to gather for fun and fellowship. In the north end of the plaza are monuments honoring the life and work of Drs. D.D. Palmer, B.J. Palmer and Sid Williams. Center for Chiropractic Education — CCE is the primary location for most of the educational facilities, some of the departmental faculty (Chiropractic Science) and the administration offices for the College of Chiropractic. This building also houses Postgraduate Education, an A/V productions support satellite office and the Student Success Center. The building contains a 360-seat amphitheater-style, auditorium lecture center, two 200-seat classrooms, four 125-seat classrooms, two 40-seat classrooms and nine dry labs, which are available for instructional and student needs. These classrooms provide for lecture and lab facilities including radiology, diagnosis and dry anatomical instruction. Center for Health and Optimum Performance (C-HOP) — C-HOP, LIFE’s outpatient clinic, is located just inside the east entrance to the campus (1415 Barclay Circle). This 28,000 square foot clinic, open to the public, is equipped with state-of-the-art equipment and is fully staffed with chiropractors and board-certified specialists who serve as mentors to students. C-HOP services more than 60,000 patient visits per year with expert chiropractic care, wellness coaching, nutritional counseling and functional kinesiology. NeuroLIFE Institute — This public facility is on the leading edge of research in Chiropractic Neurology. Chiropractic Neurology builds on basic neuroscience and uses various strategies to help improve or re-establish optimal neurological processes. For many individuals who have dealt with neurological or cognitive impairments, the chiropractic functional neurologist can provide carefully determined, cautious and safe care that holds the prospect of potentially improving neurological function. Marketing Department, Human Resources, Office of Institutional Effectiveness, Planning and Research (OIEPR), Physical Plant and Grounds — These departments are located in two recently remodeled buildings at 1075 & 1085 Barclay Circle near the entrance from South Cobb Drive. Center for Athletics and Sport Health Science (SHS) — This building houses two gymnasiums, health and wellness facilities, and offices for Student Services, Athletics, University Advancement and many graduate degree programs and offices. It is located across the street from the primary academic buildings. An elevated walkway provides safe passage over Barclay Circle (the main street running through campus). The main gymnasium seats 1,800 spectators for sports activities with the potential to seat over 2,500 using additional, temporary seats for graduations, assemblies and other special events. The University installed ceiling-mounted, remote-controlled lighting equipment, certain audio visual equipment in the existing gymnasiums, as well as staging, removable chairs and floor covering in the fall of 2008 for use as a gymnatorium. These improvements permit the University to use both of the existing gymnasiums as dual use facilities – as both auditoriums and gymnasiums. A popular feature of this building is the Wellness Center, which includes state-of-the-art weight training equipment, cardio-fitness equipment and racquetball courts. Membership to the Wellness Center is free for all students, faculty and staff. The Sport Health Science program’s research facilities include laboratory space for biomechanics, exercise physiology, product research and rehabilitation, and LIFE Center for Seniors. This facility is designed to assess and expand the limits of human performance potential. Ian Grassam Treehouse — Located next to the Center for Athletics and Sport Health Science, The Treehouse is set amongst the trees and the pond. The Treehouse is a student retreat and a peaceful setting to study during the week or to hang out on weekends. Athletic Fields — Fields include a lighted rugby pitch (field), lighted tennis courts and a 2,500-seat multi-use track and field stadium. The track and field facility was used as a training site for the 1996 Summer Olympic Games held in Atlanta. An 8,000 square-foot Stadium Field House provides concession areas and restrooms. Life University’s world-class rugby teams practice and play their games on the pitch. Walking/Hiking Trails — Approximately three miles of wooded trails wind through campus, providing opportunities for recreation, reflection and connection with the natural environment. 19th Century Historic Village — Take a walk down the wooded path and be transported to a different time and place. This tranquil village contains actual 19th century structures, including a fully functional gristmill. Students, staff and visitors come here to relax and reflect on simpler times. Bell Tower — This campus landmark is a monument to the early pioneers of Chiropractic. In the early days, chiropractors were sometimes jailed for practicing “medicine” without a license. The names inscribed on the interior walls of the Bell Tower honor all those who suffered the indignity of imprisonment for helping their fellow man. Tolerance — This monument resembles the Olympic Torch from the 1996 Summer Games that were held in Atlanta. Tolerance reminds the LIFE community that one of the highest and noblest aspirations a human being can attain is tolerance for other peoples’ beliefs, values, ideals and creeds. Lyceum Park and Standard Process Amphitheatre — A central park that replaced acres of concrete and parking lots, Lyceum Park serves as a gathering place for students, faculty and staff. Designed with natural acoustics and a state-of-the-art audio system, the Standard Process Amphitheatre provides a unique venue for outdoor concerts, lectures, movies, plays and other events such as the periodic “Welcome Back” student parties. The natural stone seating, serene gardening, quiet alcoves and idyllic beauty makes the park a popular place for students who come to study, socialize, enjoy lunch or pause for a break between classes. 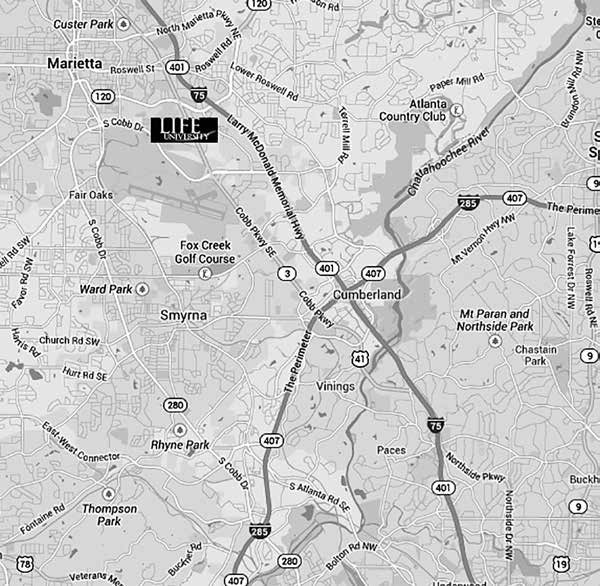 The University is located in Cobb County, a thriving suburban community with a population of 720,000. Many shopping malls, day-care centers, schools and other basic services are located throughout the area. A public bus system with connections to the Atlanta transit system stops just outside the campus, though many students find it more convenient to own their own transportation in order to take advantage of the recreational opportunities in the metro Atlanta area. Metropolitan Atlanta (which includes Cobb County) has a strong, diversified economy. Atlanta is a major convention, financial and transportation center. Many service jobs in hotels and restaurants are available. One of the best features of the metro Atlanta area is the climate. In January and February, the average daily temperature is approximately 50 degrees Fahrenheit; the average nightly temperature is approximately 30 degrees Fahrenheit. One or two light snowfalls during the winter are the norm. During the summer months, the average daytime high is in the 90s and the average nighttime low is in the 70s. Atlanta is ideally located in northern Georgia within easy reach of a variety of recreational activities. An hour north is the southern end of the Appalachian Mountain range where the Appalachian Trail and some of the best hiking in the country begin. The mountains offer many kinds of recreational opportunities including camping and water sports on lakes and rivers. Georgia’s Atlantic seacoast with its beaches, unspoiled barrier islands and historic port towns is just four to five hours southeast of the city. The location of Life University in metropolitan Atlanta offers a number of unique advantages. This city offers a blend of Old South charm and New South progress and growth. There are outstanding cultural and recreational opportunities ranging from world-class museums to theater and symphony to professional sport teams. Life University’s campus is located just a few miles northwest of Atlanta, in the city of Marietta, Georgia. Our Campus Safety Office, where we request all visitors check in and obtain a visitor parking pass, is located in Mod 2 behind the Learning Resource Center.